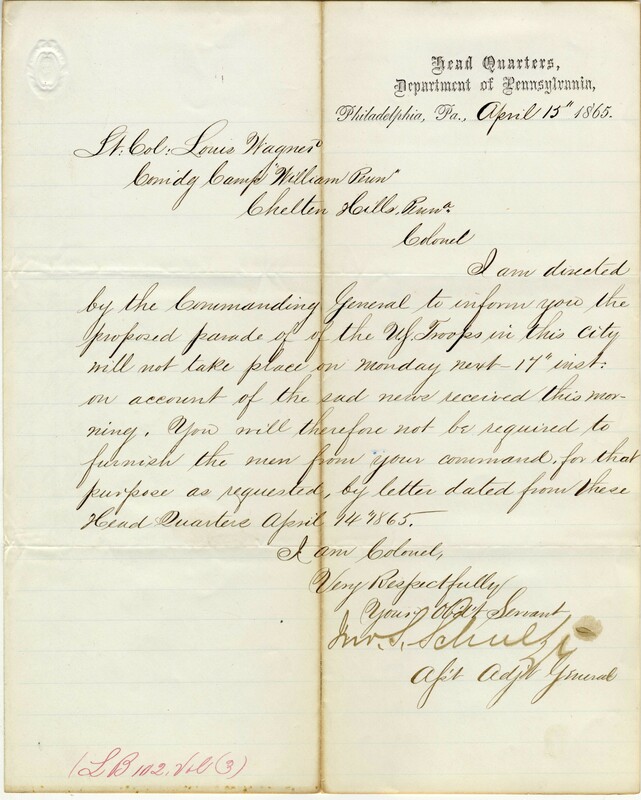 In light of the assassination of Abraham Lincoln, General S. Schultz informs Colonel Louis Wagnerd that a celebratory parade for the end of the war in Pennsylvania would not go on as planned. Philadelphia, Pa. April 15th 1865. I am directed by the Commanding General to inform you the proposed parade of of he U.S. Troops in this city will not take place on monday next 17" isnt. on account of the sad news received this morning. You will therefore not be required to furnish the men from your command, for that purpose as requested, by the letter dated from these Head Quarters April 14" 1965.